Fluoroquinolones are broad-spectrum antibacterials that have experienced an upsurge in use in recent years. Because of their broad-spectrum activity, high efficacy, favorable dosing, and availability in oral and IV form, these agents are indicated for a range of bacterial infections, including respiratory, GI, and urinary tract infections. Earlier generations of fluoroquinolones (e.g., ofloxacin) had limited activity against some respiratory pathogens, such as S. pneumoniae. However, more recent fluoroquinolone agents (so-called third-generation agents or the "respiratory fluoroquinolones") are active against a broad spectrum of gram-positive and gram-negative bacteria, including atypical organisms. Therefore, they are highly effective in RTIs. An important factor influencing the use of recently launched fluoroquinolones is that several agents from this class were withdrawn from the market owing to toxicity (e.g., trovafloxacin [Pfizer's Trovan], grepafloxacin [GlaxoSmithKline's Raxar]). 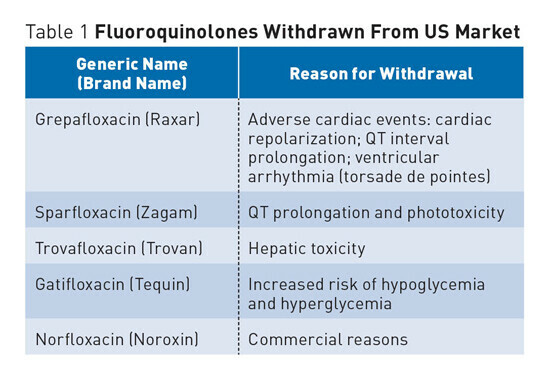 Fluoroquinolones, as a class, are associated with alterations in normal cardiac conduction (i.e., prolongation of the QT interval), which can cause cardiac arrhythmias in vulnerable individuals. The degree of QT prolongation varies for each agent. Among these, sparfloxacin (Mylan's Zagam) and grepafloxacin have been associated with the longest QT prolongation. Both of these agents have now been removed from the U.S. market. Grepafloxacin use resulted in seven associated cardiac-related deaths. To date, resistance to the fluoroquinolones by respiratory pathogens has been extremely rare. However, increasing fluoroquinolone resistance in S. pneumoniae isolates has been reported, and clinical failures with levofloxacin have been noted in Canada. Fluoroquinolone-resistant isolates are more common among persons older than 65, who have the highest level of fluoroquinolone use. Prior exposure to fluoroquinolones is one of the major risk factors for the acquisition of levofloxacin-resistant S. pneumoniae. Emerging resistance to older fluoroquinolones, such as ciprofloxacin, has also been demonstrated worldwide, ranging from 3% to 12%. 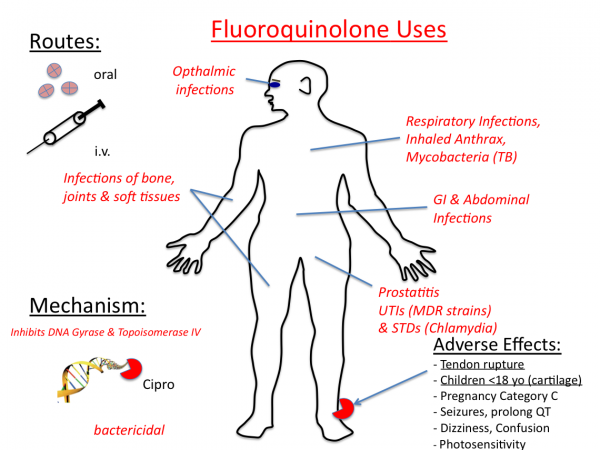 Fluoroquinolone resistance often involves alteration of their targets, the topoisomerases. Fluoroquinolones interact with two related yet distinct targets within the bacterial cell: DNA gyrase and topoisomerase IV. DNA gyrase and topoisomerase IV are vital enzymes involved in bacterial DNA replication. These agents are potent inhibitors of nucleic acid synthesis. The exact nature of the interaction of quinolones with their target enzymes is not completely understood. However, this interaction blocks the progression of DNA replication, leading to strand breaks and rapid cell death. The inhibition of DNA gyrase is bactericidal, whereas inhibition of topoisomerase IV is primarily bacteriostatic. Levofloxacin (Johnson & Johnson's Levaquin, Sanofi-Aventis' Tavanic, Daiichi's Cravit) is approved for the treatment of acute exacerbations of chronic bronchitis and several other bacterial infections (e.g., pneumonia, urinary tract infection, skin infections). Levofloxacin was first launched in Japan in 1993 and has been widely available since 1998. The agent is expected to lose patent protection in the United States and Japan in 2010 and in Europe in 2011. The drug is a broad-spectrum antibacterial and is available in both oral and IV formulations. Levofloxacin is the levo enantiomer of ofloxacin (Ortho McNeil's Floxin, generics). The agent's mechanism of action involves inhibition of bacterial topoisomerase IV and DNA gyrase, which are enzymes required for DNA replication, transcription, repair, and recombination. Levofloxacin has in vitro activity against a wide range of gram-negative and gram-positive microorganisms. A randomized, double-blind, multicenter Phase III study among adult patients with acute exacerbations of chronic bronchitis compared the efficacy and safety of two different doses of levofloxacin with cefuroxime axetil. A total of 832 patients were randomized to receive oral levofloxacin (250 mg or 500 mg once daily) or oral cefuroxime axetil (250 mg twice daily) for 7-10 days. The primary efficacy analysis was based on the clinical response in patients with bacteriologically confirmed acute exacerbations of chronic bronchitis , determined 5-14 days after the end of therapy. Both doses of levofloxacin were at least as effective as cefuroxime axetil and were active against the main pathogens of clinical relevance (H. influenzae, S. pneumoniae, and M. catarrhalis). The cure rates in the treated population were 70% for levofloxacin 250 mg, 70% for levofloxacin 500 mg, and 61% for cefuroxime axetil. All three treatment regimens were equally well tolerated. Gatifloxacin. Gatifloxacin (Bristol-Myers Squibb's Tequin, Kyorin/Dainippon's Gatiflo) was approved in the United States in December 1999 in both oral and IV formulations. The oral drug was launched in Japan in June 2002, where Kyorin is comarketing the drug with Dainippon Pharmaceutical. Gatifloxacin has a broad spectrum of activity similar to that observed in other third-generation fluoroquinolones. The agent is well absorbed following oral administration (with close to 100% bioavailability), and its phar-macodynamic and pharmacokinetic properties (e.g., high volume of distribution, long elimination half-life) allow for once-daily administration. A multi-center, prospective, randomized, double-blind, Phase III study in 527 adult outpatients with acute exacerbations of chronic bronchitis compared therapy with either 400 mg of gatifloxacin once daily for 5 or 7 days, or 500 mg clarithromycin twice daily for 10 days. Researchers followed up patients in these trial groups for 21-28 days after treatment ended. Overall clinical efficacy (including efficacy at the last follow-up) in all three treatment groups was 87%, proving clinical equivalence not only between gatifloxacin and clarithromycin but also between gatifloxacin five-day therapy and gatifloxacin seven-day therapy. Overall microbiological eradication rates (excluding patients with resistant pathogens) were 98%, 94%, and 98% in the gatifloxacin five-day, seven-day, and clarithromycin groups, respectively. All S. pneumoniae and H. influenzae isolates identified before study treatment were susceptible to gatifloxacin, and no pathogens susceptible to gatifloxacin before treatment developed resistance during therapy. The researchers did not report the overall rate of drug-related adverse events in the study but listed the most common adverse events as diarrhea (7% in gatifloxacin five-day therapy, 6% in gatifloxacin seven-day therapy, and 6% in clarithromycin ten-day therapy groups) and nausea (5%, 6%, and 6%, respectively). Gatifloxacin's product labeling warns against giving this agent to patients with long QT syndrome. It should not be given to those receiving type IA or III antiarrhythmics and should be used with caution if the patient is receiving other drugs that prolong the QT interval. In postmarketing surveillance, serious disturbances of glucose homeostasis in diabetic patients being treated with gatifloxacin have been reported. The relevance of this phenomenon and its effect on the drug's use are not clear at this time.